Handmade aluminium and iron fireplace screen fashioned after the "Métro du Palais" side rail found at the subway stations in Paris designed by Hector Guimard. The screen features highly polished aluminium accents fixed to a black iron frame. Product handcrafted in the USA with the highest quality materials and over 30 years of experience in luxury lighting (chandeliers, floor lamps, table lamps, and sconces), fine furniture, bronze sculpture and in all home decor design styles. Bronze sculptures cast using the lost wax bronze method as utilized by the original master sculpture artists, casts originate from original antique works not degraded copies or artistic conceptions! 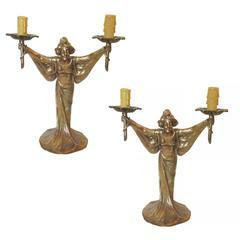 Art Deco decor proudly operates with the highest ethical core values as a foundation. Antique products are authentic, else otherwise noted. Our products are made in America with pride. 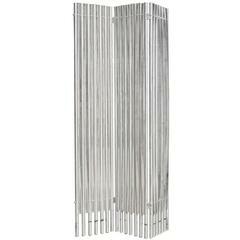 Rare Lucite and aluminum folding wall divider designed by Charles Hollis Jones. The wall divider is a tri-fold panel screen, it has three partition each 12" wide and 60" tall. Art Deco French wrought iron fireplace screen with hand-hammered effect throughout. Purchased from the Parisian flea.